Matilda Jane – Exclusive Girls Fashions have chosen to Partner with Sweet Repeats & Boutique to host a spectacular trunk show experience. This is the first time ever, Matilda Jane has partnered with a retail boutique to bring our valued clients this awesome opportunity to preview the latest in Matilda Jane Fashions. Matilda Jane Event Open To The Public Today at 2:00pm! 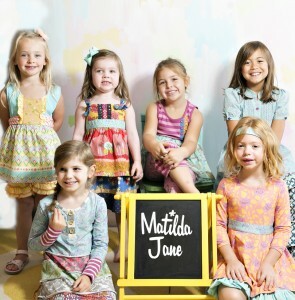 Matilda Jane Clothing is exclusively sold through our Trunk Keepers, most often at a Trunk Show. A Trunk Show is when a Jane—it could be you—hosts a party where a Trunk Keeper showcases the amazing new styles that Matilda Jane has to offer. It’s like a personal shopping event, right in your living room. Both you, your guests and their girls will be able to experience the newest Matilda Jane Clothing collection firsthand, try on the line and feel the incredible amount of love that was put into each and every piece. Feel free to join us today at 2:00pm for a wonderful show, with free refreshments! 2823 US Hwy 301 N.
Sweet Repeats And Boutique is Your Premier Children's Clothing Store Serving Ellenton, Bradenton, Sarasota, Lakewood Ranch!